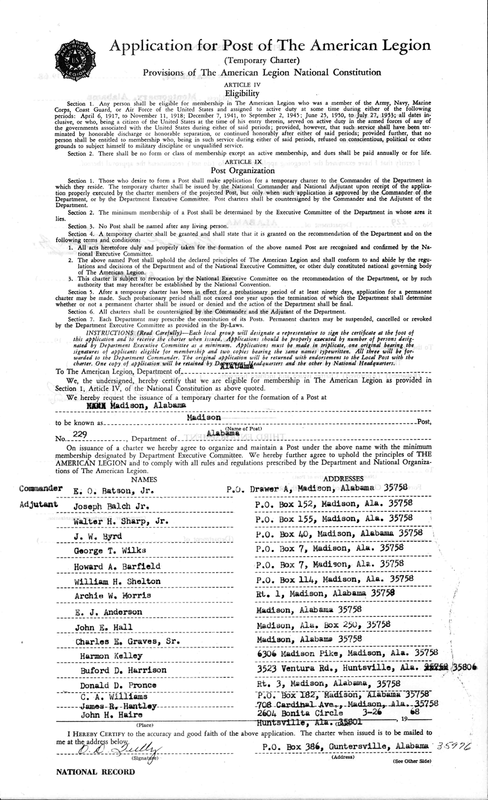 The Post received its first endorsement on August 28th, 1947, its second endorsement on September 2nd of that year, and its third endorsement sometime prior to March 13th, 1948, the date Post 201's charter was signed. This document now hangs outside the court room in Madison's City Municipal Complex. 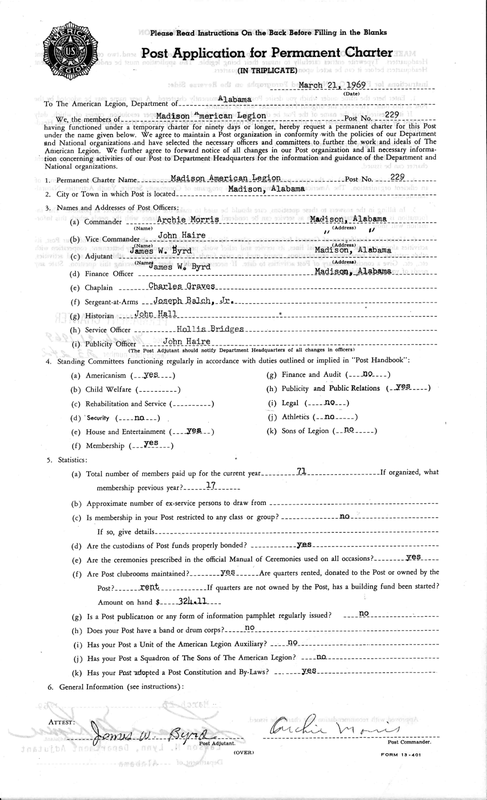 The required number of persons duly qualified for membership having applied therefore as such application having therefore been approved in due form. at Madison to be known as Madison Past No. 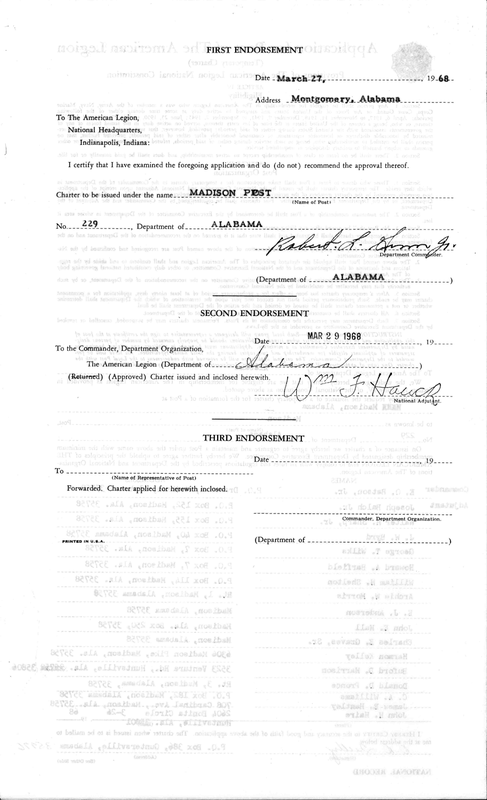 201 Department of Alabama, and this instrument, unless revoked or suspended, shall be conducive evidence of the lawful existence thereof. 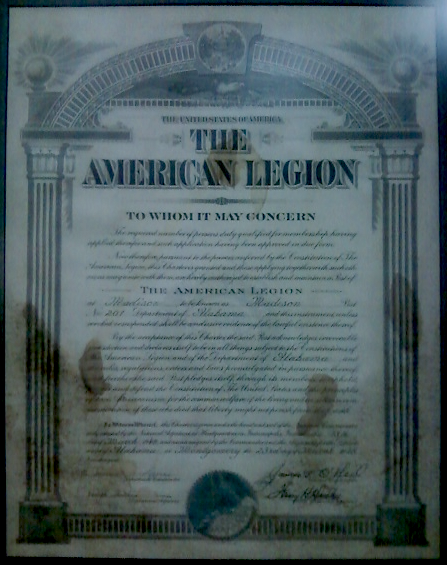 By the acceptance of this Charter the said Post acknowledges irrevocable jurisdiction and declares itself to be in all things to be a subject to the Constitutions of The American Legion and the Department of Alabama, and the rules, regulations, orders, and laws promulgated in pursuance thereof; and further the said Post pledges itself through its members, to uphold, protect, and defend the Constitution of the United States and the principles of true Americanism, for the common welfare of the living and in solemn commemoration of those who died that liberty might not perish from the Earth. 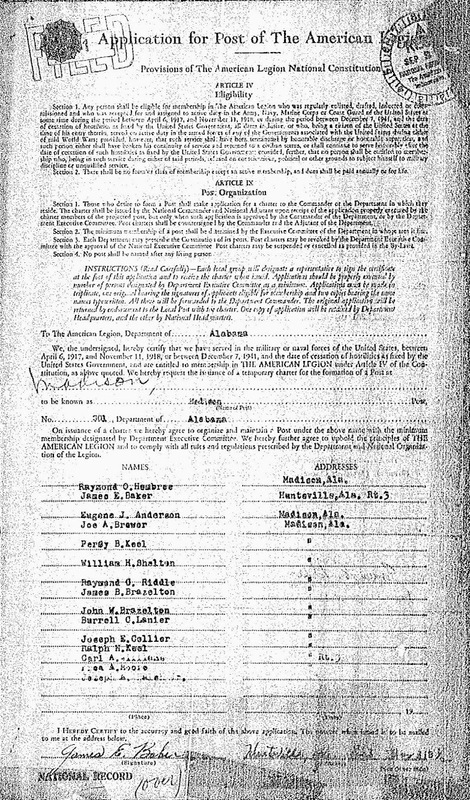 In Witness Thereof, this Charter is given under the hand and seal of the National Commander, duly attested by the National Adjutant at Headquarters in Indianapolis, Indiana, this 13th day of March, 1948, and countersigned by the Commander and the Adjutant of the Department of Alabama at Mongomery the 23rd of March, 1948. Information on the history of this Post is vague, but some members of Post 229 familiar with this older Post have stated that it, at some point, had a post home, but lost it, and at some point, the Post lost its charter. 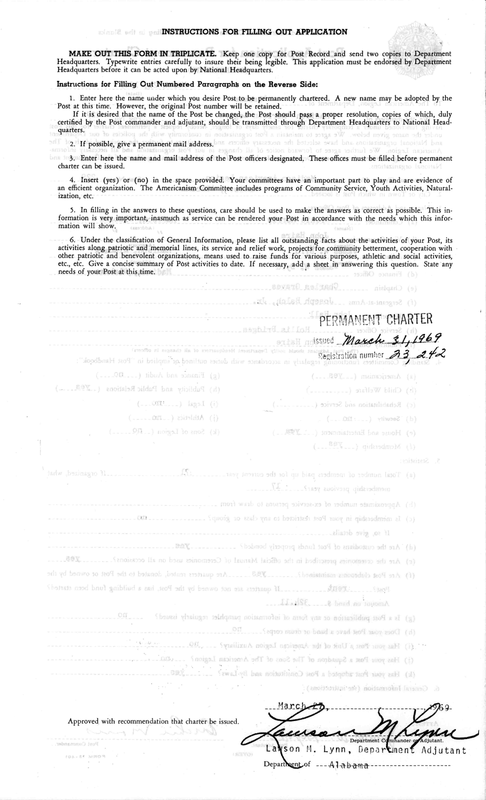 Post 229 submitted its application for temporary charter in late 1967/ early 1968. Worth observation is that some of the names listed in the original charter of Post 201 are also listed on the charter of Post 229. It is unknown at this time whether or not they were actually the same individuals, but it would be fair to assume so. The Post received its first endorsement on 27 march 1968 and its second endorsement on 29 March 1968. 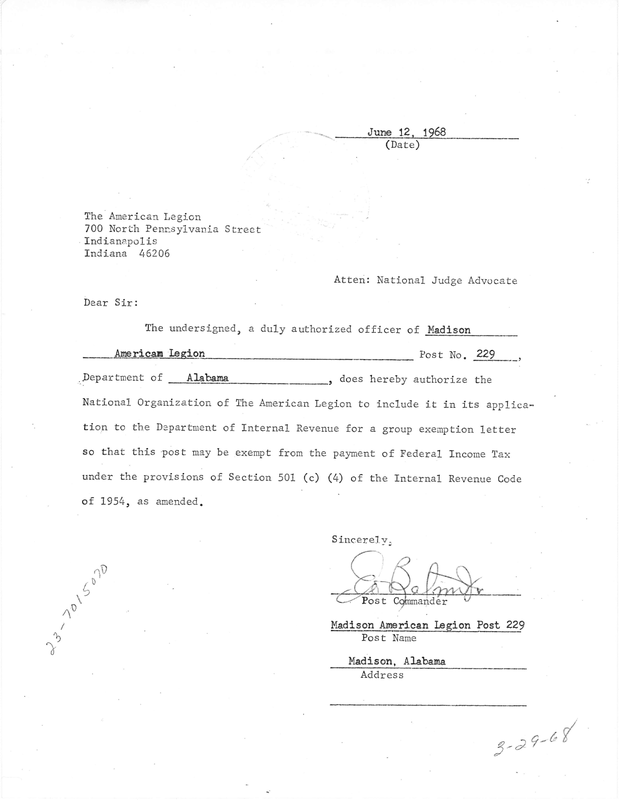 The Post was originally classified as a 501(c)(4) under the IRS Code of 1954. 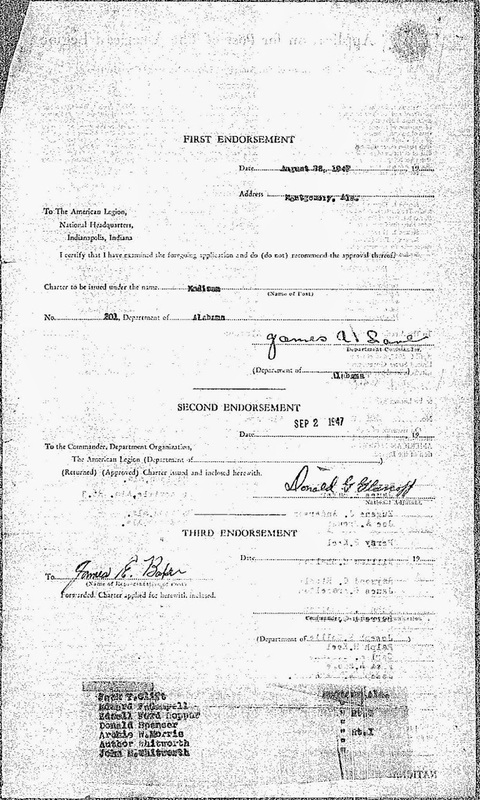 The following year, the Post applied for permanent charter. The Post by this point had grown from its original 17 members to 71 and had a Post club that it rented space for. The Post was issued its permanent charter on 31 March 1969. If you have history to contribute, please email the webmaster.